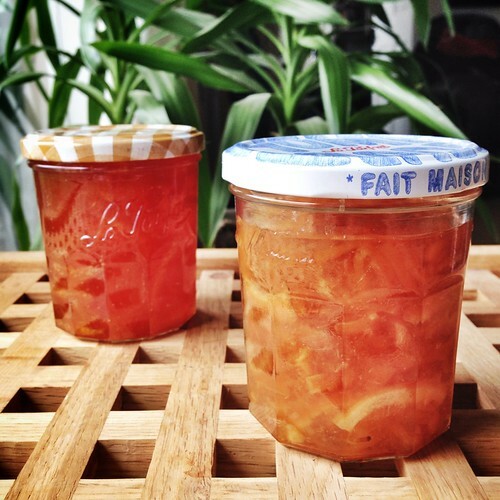 This week I’ve taken on a new preserving interest: marmalade! What brought this on was not the imminent end of Seville Orange season, but rather the discovery of a new fruit: the Bergamot orange! Naturally, the mention of “gin and tonic” got my attention, so I asked her what she was talking about and she kindly revealed the contents of her bag – a bundle of little “Bergamots”, something I’d never seen before. So I decided to get a few and find out what the fuss was all about. Indeed they do make great tea, and are wonderful juiced in smoothies (I surprisingly haven’t tried the gin and tonics yet). Knowing that my access to Bergamots (and organic ones at that!) would be short lived, I wanted to do something to preserve the bounty. My friend Kavey picked some up last weekend and preserved them in syrup following her same recipe for candied clementines. I decided to use the opportunity to finally have a go at making marmalade, one of my favourite preserves and something I find far more versatile than jams (case in point: buckwheat crepes with marmalade and toasted flaked almonds – superb!). I read up on marmalade and was immediately intimidated by the numerous steps involved. Peeling, blanching, soaking, slicing, boiling, de-seeding and wrapping things in muslin. Different people seem to have different methods, and as I read, my brain became a fog, so much so that I could no longer differentiate between pith, pulp and peel. Fortunately I found a couple of recipes that helped simplify it all for me. I was so excited by the success of my Bergamot marmalade that I decided to do it all over again with grapefruit and lemons. I had a hunch that grapefruit would require some special treatment, being so thick-skinned and pithy, so I went back to my marmalade recipe research and found Pam Corbin’s whole fruit method for making marmalade in The River Cottage Preserves Handbook (the recipe uses Seville oranges but you can adapt it for other fruits). The recipe involves boiling the whole fruit to soften the skin, then halving and de-seeding the fruit before slicing it into strips. Again, for this marmalade newbie, I appreciated finding a recipe that was crystal clear about every step (and didn’t require me tying anything in muslin). While the grapefruit marmalade was boiling away, I gave it a taste and thought it was a little TOO bitter. Some sort of divine intervention from the marmalade gods took over (or was it subconscious remembrance of the Hawkshead relish company) and I decided to add some ginger. Marmalade transformed! I have had the pleasure of watching this weeks marmalade making and of course eating the results! Lucky me 😉 When Monica mention’s the ‘marmalade gods’ she is not kidding. I was unconvinced by the introduction of ginger. One word: GENIUS! 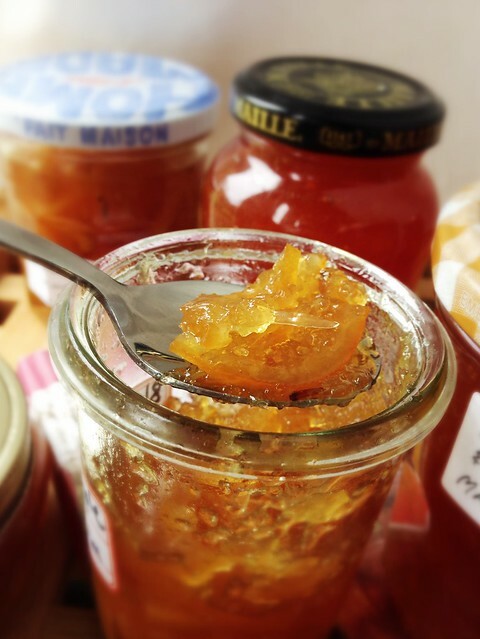 Oh please please please save me a tiny bit of your bergamot marmalade, I’m dying to try it! And thanks for the link too! For a great cocktail, just put some marmalade into the bottom of the glass and pour prosecco or champagne over it. Even I like bubbly that way! Thank you so much for the nomination. Yes the Bergamots are VERY fragrant. The zest is out of this world!